Portsmouth University have accurately surveyed a series of control markers on Chesil Beach and along the Fleet foreshore. The aim is to provide a series of easily located points that can be used as reference locations for studies conducted on the Fleet and Chesil Beach. The Fleet Study Group recommend that these markers are used for all studies to ensure a common geographic reference is used. 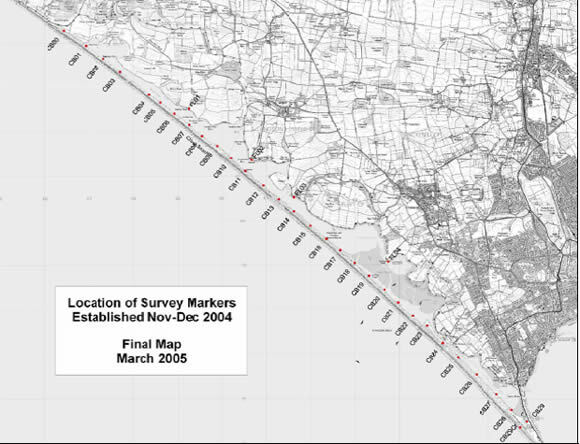 The survey work was conducted in 2004 and the technical report setting out the survey methodology used and the location of all the markers is available by clicking here. Note that this is a very large file (2.7 Mbytes). The markers consist of either existing objects such as stakes, posts, etc, or lengths of 3" angle iron driven into the ground. The reference markers can be used with theodolites to give accurate bearings and position fixing by triangulation. Alternatively using two standard GPS receivers in pseudo differential mode with one receiver located at a reference marker can provide enhanced position accuracy over the use of a single GPS receiver. The markers can also be used for educational purposes such as a field exercise in surveying techniques. They can also be used as known locations for photographic surveys. Please note that the provision of this information does not give or imply permission to access some of the reference markers which are located on private property. Please approach Don Moxom, the Fleet Warden, in the first instance. He can advise on access permissions and the current status of the markers. He can be contacted at the Chesil Bank and the Fleet Nature Reserve office at Ferrybridge on 01305 760579.